The PTFIX features a range of mounting configurations, a 2 to 18 terminal point option, and 11 color options. The mounting configurations range from horizontal to transverse positioning on a standard 35-mm DIN rail and 15-mm DIN rail. Terminal point options range between 1.5mm squared and 4 mm squared. 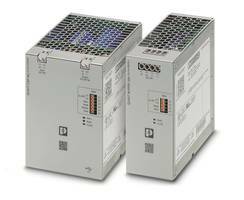 Middletown, Pa. – Phoenix Contact introduces PTFIX potential distribution blocks, a flexible, modular system that’s ready to connect right out of the box. 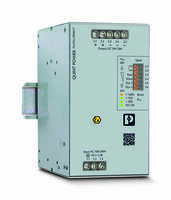 The push-in connection and modular design minimize the need for additional tools or accessories, saving valuable time and space. PTFIX distribution blocks offer a flexible range of mounting configurations, including both horizontal and transverse positioning on standard 35-mm DIN rail and “mini” 15-mm DIN rail. The transverse position, paired with the minimal footprint, saves the user up to 50 percent more space than mounting horizontally when installed in a control cabinet. PTFIX is also available in other mounting configurations, such as direct mounting with flanges and tool-free adhesive mounting. These flexible options ensure that there is a solution for a vast array of applications. 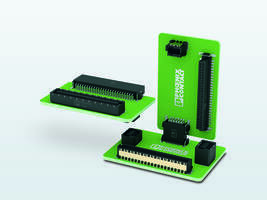 This product line offers 2, 6, 12, and 18 terminal-point options in 1.5 mm2, 2.5 mm2, and 4 mm2. All cross sections have the option of including a large feed-in contact. The wide variety makes it suitable for a broad range of applications. PTFIX is also available in 11 color options from the factory. 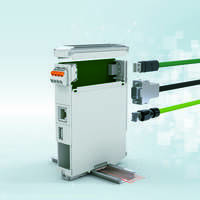 PTFIX potential distribution blocks are the newest member of Phoenix Contact’s Push-in Technology family, joining the thousands of other parts featuring the quick connection. 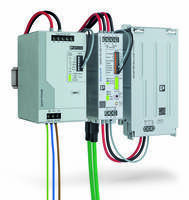 Phoenix Contact features Push-in Technology on terminal blocks, relays, power supplies, heavy-duty connectors, and many other components. 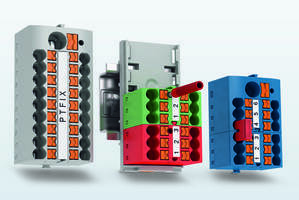 Learn more about PTFIX at www.phoenixcontact.com/ptfixblocks. PCB Connectors suit high voltage applications. MP 1.5 Micro Terminal Blocks can be secured on NS 15 DIN rail. Test Plug Adapters are designed for small terminal blocks. Terminal Block uses one switch to shunt secondaries.